A three-stage Proton rocket moves to its launch pad in Baikonur in July 2000. This version of the vehicle launched Soviet Salyut space stations, the core module of the Mir space station and the Zvezda service module for the International Space Station. 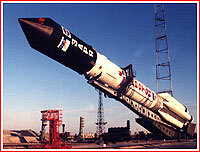 No other launcher has played as many roles in the Russian space program as has the UR-500 rocket, known today as Proton. Conceived at the dawn of the space race as a "super-size" ICBM, the UR-500 became a major player in the race to the Moon in the mid-1960s. In the 1970s and 1980s, the four-stage version of the launch vehicle launched Soviet planetary probes toward the Moon, Mars, Venus and Halley Comet and allowed the Soviet Union to place satellites into geostationary orbit. At the same time, three-stage Protons launched all Soviet space stations, as well as heavy transport ships and modules to expand and resupply them in space. The rocket was formally declared operational only in 1978. In the 1990s, the Proton became the workhorse of Russia's commercial launch business, winning its first contract to deliver an Inmarsat communications satellite in 1993 and launching its first commercial payload on April 9, 1996. After almost half a century in operation, Proton rockets logged 400 missions by the end of 2014. Around the same time, Briz-M space tug, serving as Proton's newest fourth stage, logged more than 70 missions. More than 450 satellites were launched during this period, according to the rocket's developer GKNPTs Khrunichev. Proton's main production line in Moscow. After initial four test launches, Proton was upgraded with a third stage, which became a standard part of the vehicle. It is currently propelled by an RD-0212 multi-engine propulsion system, which includes the RD-0213 main engine and a four-chamber steering thruster known as RD-0214. Both propulsion units were developed at the KBKhA design bureau in the city of Voronezh and mass produced by an adjacent mechanical plant, VMZ. The Proton-M, sometimes identified as Proton-KM, featured several modifications, which were designed to increase the payload and reliability of the vehicle, compared to the previous version of the rocket, known as Proton-K. For the first time, a digital flight control system replaced traditional analog hardware onboard Proton. It allowed more efficient propellant consumption during the flight and, as a result, the delivery of bigger payloads into orbit. The rocket became even more powerful thanks to a new version of the RD-253 engines on its first stage. Moscow's Energomash development center increased the thrust of the engine from 151 to 160 tons. With these two improvements the Proton-M was able to deliver 22 tons of cargo into low Earth orbit compared to 20.7 tons for the standard Proton-K booster. Proton-M/Briz-M vehicle made its successful inaugural flight in 2001 and delivered its first commercial payload on Dec. 30, 2002. For missions beyond initial low orbits, the new Proton was equipped with a more advanced fourth stage called Briz-M. 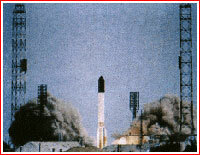 The new stage completed its inaugural flight onboard a regular Proton-K booster in May 2000, when it is delivered the Gorizont communications satellite. Briz-M takes much less space onboard the launch vehicle compared to its predecessor, the Block D upper stage, leaving the freed volume for cargo. 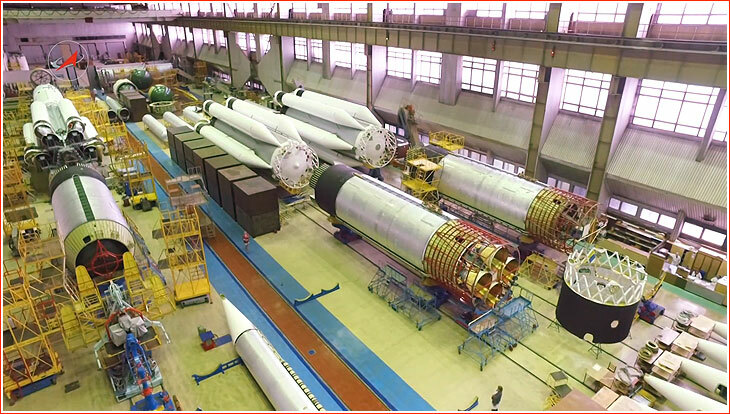 As a result, the new payload shroud topping the rocket could offer 2.5 times more room for the satellites onboard Proton-M.
For a number of years, Khrunichev enterprise in Moscow, which builds the Proton rocket, hoped to introduce even more drastic changes in the Proton's design. KB Salyut, Khrunichev's development arm, planned a much more powerful upper stage than the Briz-M. Designated KVRB, it was to employ super-cold liquid hydrogen and liquid oxygen -- the same propellant used in the US Space Shuttle's main engines and in the Energia rocket. 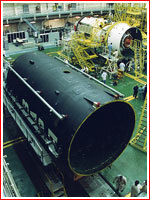 The development of a cryogenic stage initiated by Khrunichev in 1980s was stalled for years by Russia's financial problems. Work, however, has progressed somewhat during the first decade of the 21st century, thanks to commercial deals with India, which eyed similar technology for its own space launcher. KB Salyut has developed the cryogenic upper stage for the Indian government and hopes to use its off-the-shelf technology for the even bigger stage for Proton. KB Salyut representatives said that the Proton's cryogenic stage would house 18 tons of propellants compared to the 12 tons carried by the stage developed for the Indian rocket. With the new cryogenic stage, Proton would be able to compete with the Ariane-5 rocket, the most advanced European launcher, despite the geographical disadvantage of flying from Kazakhstan compared to Ariane's launch pad in equatorial region of French Guiana. On Sept. 7, 2006, the American aerospace giant Lockheed Martin announced the sale of its stake in the International Launch Services, ILS, which had been marketing the Russian Proton rocket to commercial clients around the world. The move ended a more than decade-long partnership between Lockheed Martin and the Moscow-based GKNPTs Khrunichev, the Proton manufacturer. In the first decade of the 21st century, developers planned a new series of upgrades to the Proton M rocket and its Briz-M upper stage to increase its payload to geostationary transfer orbits from 6,150 kilograms to 6,300 kilograms. Modifications to the Briz-M would enable it to fly so-called supersync missions, in which payloads are inserted into a supersynchronous orbit with an apogee of 65,000 kilometers or almost twice higher than the final altitude for a typical communications satellite. Such a trajectory on the way to a regular geostationary orbit would yield around 150-200 kilograms in extra payload mass. This is close to the payload capacity which was lost after Kazakhstan banned the launch path to the 48-degree parking orbit. The Kazakh government's decision to prohibit launches below the standard 51-degree parking orbit after 2009 was at least partially prompted by a JCSAT-11 launch failure, which resulted in debris crashing within 40-50 miles of the town of Dzhezkazgan. The first missions using supersync launch profile were scheduled for 2011, however not all satellites would be capable of supporting such flight sequences. As a result, Proton was expected to fly both types of missions. In the meantime, the last Proton-K rocket launched on March 30, 2012, with the final Oko early warning satellite. Looking to expand payload capabilities of the Proton rocket downwards, its developer proposed smaller, cheaper version of Russia's commercial space workhorse in 2016. If ever built, the Proton-Light variant is expected to have the industrial designation 8K82KL. 1965 Nov. 2: An UR-500 rocket lifts off from Site 81 in Tyuratam delivering the Proton-2 spacecraft. 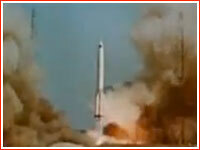 1966 March 24: An UR-500 fails to deliver a spacecraft after launch from Site 81 in Tyuratam. 1966 July 6: An UR-500 rocket lifts off from Site 81 in Tyuratam successfully delivering the Proton-3 spacecraft. 1967 March 10: The first UR-500K rocket, equippped with a Block D upper stage, lifts off from Site 81 in Tyuratam carrying the first prototype of the 7K-L1 circumlunar spacecraft. It was announced as Kosmos-146. 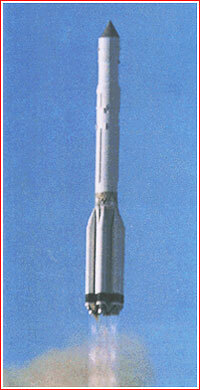 1967 April 8: An UR-500K rocket lifts off from Site 81 in Tyuratam carrying a prototype of the 7K-L1 No. 3P circumlunar spacecraft, which is stranded in low Earth's orbit due to Block D failure. It was announced as Kosmos-154. 1967 Sept. 28: An UR-500K rocket fails to deliver the 7K-L1 No. 4L spacecraft. The launch was not announced. 1967 Nov. 22: An UR-500K rocket fails to deliver the 7K-L1 No. 5L spacecraft after launch from the newly completed "right" launch pad (known today as Pad No. 24) at Site 81 in Tyuratam. The launch was not announced. 1968 March 2: An UR-500K rocket lifts off from the "left" launch pad at Site 81 in Tyuratam carrying the 7K-L1 No. 6L spacecraft. It was announced as Zond-4. 1968 April 23: An UR-500K rocket fails to deliver the L1 No. 7L spacecraft after launch from the "right" launch pad at Site 81. The launch was not announced. 1968 Sept. 15: An UR-500K rocket lifts off from the "left" launch pad at Site 81 in Tyuratam carrying the 7K-L1 No. 9L spacecraft. It was announced as Zond-5. 1968 Nov. 10: An UR-500K rocket lifts off from the "left" launch pad at Site 81 in Tyuratam carrying the 7K-L1 No. 12L spacecraft. It was announced as Zond-6. 1968 Nov. 16: An UR-500K rocket successfully launches the Proton-4 science spacecraft from the "right" launch pad of Site 81 in Tyuratam. 1969 Jan. 20: An UR-500K rocket fails to deliver the 7K-L1 No. 13L spacecraft into orbit after launch from "left" launch pad of Site 81 in Tyuratam. 1969 Feb. 19: An UR-500K rocket fails to place a E8 lunar lander into orbit after launch from "right" launch pad of Site 81 in Tyuratam. 1969 March 27: An UR-500K rocket fails to place a Mars-69 spacecraft in orbit after launch from "right" pad at Site 81 in Tyuratam. The Proton rocket with the L1 spacecraft for circumlunar missions is poised for launch in Baikonur. A Proton rocket with the Kristall module of the Mir space station sits on the launch pad in Area 200 of Baikonur Cosmodrome, shortly before launch on May 31, 1990. 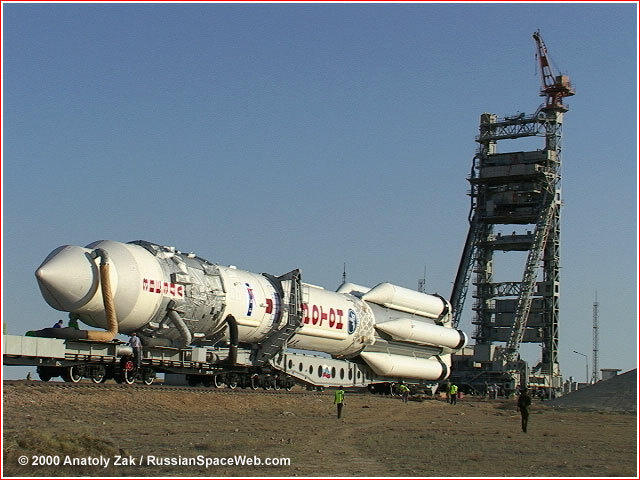 The Proton rocket with the Zarya FGB control module is being erected on the launch pad in November 1998. Click to enlarge.